The second Age of Wonders 3 expansion has been revealed as Eternal Lords, a major blast of content that will add new races, mechanics, an epic story campaign, and—in what will surely come as good news to the coffin botherers among you—the arrival of Necromancers. "The Necromancer’s legions march to establish an eternal kingdom, unifying all the world’s races in death," the announcement says ominously. 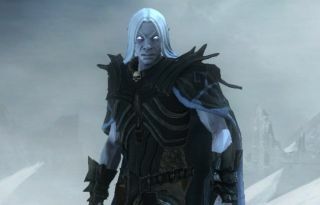 "The Necromancer creates spectacular undead units, such as the Bone Collector, a crablike monstrosity which eats corpses to strengthen itself. Other units are summoned, such as the Banshee, which invokes despair in the hearts of the living. The Necromancer’s dark magic allows players to convert towns to cities of the dead, filled with obedient Ghoul minions." That sounds pleasant, doesn't it? Eternal Lords also adds a pair of new races, the Frostlings of the frozen north, and the sun-worshiping Tigrans from the desert lands. The two of them don't seem destined to get along very well, as the new story campaign promises "an epic battle of the forces of creation: fire versus ice, life versus death." Other new features include "race governance," which will let players track their relations with each of the individual races in the game, and the "Unifier" victory condition, earned by achieving maximum Governance for a preset number of races. There are also new "Cosmic Happenings" that sound like randomized disasters that can throw worlds and plans into disarray, and new specializations, map locations, hero items, and standalone scenarios. Age of Wonders 3 came out on March 31 of last year, and we quite liked it: Our review noted that it could stand some balance adjustments and other minor fixes, "but the core game is an immediately engaging mix of strategy and tactics." The Eternal Lords expansion is set to come out on April 14, and will set you back $20.